Ephedrine information and description. 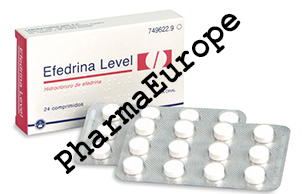 Ephedrine is a stimulant drug, belonging to a group of medicines known as sympathomimetics. Specifically it is both an alpha and beta adrenergenic agonist (you may remember Clenbuterol is a selective beta-2 agonist). In addition, Ephedrine enhances the release of nor epinephrine, a strong endogenous alpha agonist. The action of this compound is notably similar to that of the body's primary adrenergic hormone epinephrine (adrenaline), which also exhibits action toward both alpha and beta receptors. Ephedrine dosage. The athlete will generally take Ephedrine a few times daily during dieting phases of training, at a dosage of 25 to 50mg per application. The widely touted stack of Ephedrine (25-50mg), caffeine (200mg) and aspirin (300mg) is shown to be extremely potent for fat loss. In this combination, Ephedrine and caffeine both act as notable thermogenic stimulants. Increasing the dosages would not prove very efficient. Instead a break of several weeks should be taken, so that Ephedrine stack may once again work at an optimal level. Ephedrine side effects . Ephedrine can produce a number of unwelcome side effects that the user should be aware of. For starters, the stimulant effect of Ephedrine can produce shaky hands, tremors, sweating, rapid heartbeat, dizziness and feelings of inner unrest. Often these side effects subside as the user becomes more accustomed to the effect, or perhaps the dosage is lowered. In general, those negatively side effects by caffeine would probably not like the stronger effects of Ephedrine. Ephedrine is a drug but It is available OTC. Athletes use It for several reasons. It can Increase thermogenesis. which is the ability to convert excess calories into heat instead of fat, by enhancing norepinephrine release. It has been found that people who store excess body fat are Insensitive to the chemical norepinephrine (NP). NP stimulates thermogenesis In the body so that excess calories can burn Instead of being stored. Certain drugs can stimulate or potentiate the effects of NP. This in turn, would allow fat people to burn off calories as rapidly as thin people do. Ephedrine has that capability. The Chinese have used ephedrine in the form of herbal teas for thousands of years, i.e. Ephedra or MA Haung tea. Ephedrine is similar in structure to amphetamines, because of this. It mimics some of the effects of "speed" such as dampening the appetite and raising blood pressure. It Is however, much weaker and far less toxic than amphetamines (although It is banned as a stimulant by most athletic organizatlons). The effect of ephedrine Is called a "futile energy cycle." Ephedrine stimulates the conversion of thyroid into Its most active form. T-3 in peripheral tissue. This stimulates the metabolism and burns up calories quicker. Caffeine and aspirin stimulate the thermogenic effects of ephedrine. In fact It has recently become quite commonplace for pre-contest bodybullders to forgo the use of dangerous thyroid drugs and instead use a combination of ephedrine, aspirin and caffeine for cutting up. A usual dose for fat loss has been in the area of 100 mg caffeine. 50 mg ephedrine and one aspirin tablet, three times dally. I've seen athletes get totally shredded on this stack without losing any muscle! Recent studies on humans found that combining ephedrine with caffeine and aspirin enhances calorie-dissipating. Caffeine and aspirin are thought to help by suppressing agents that would normally further block release of norepinephrine. The long term effects of combining these three OTC drugs Is largely untested though. While It appears they are safe, in large dosages they could be dangerous, particularly the ephedrine. Ephedrine can also be used as a stimulant to increase workout Intensity and concentration while training. It Is also effective as an appetite suppressant for the pre-contest bodybullder and It can be used by bodybullders In an attempt to diminish the amount of fat reserves they hold. There are many supplements which boast that they can Increase fat utilization and Increase llpolysis. l.e. amino acid combinations, camitine, and lipotropics. None of those natural supplements work nearly as well as ephedrine. Ephedrine should not be used by any athlete who has had a history of heart palpitations, arrythmia, or any conductive Irregularity of the heart. Any athlete who develops these symptoms while using ephedrine should discontinue the use and consult a physician. Further caution should be used when stacking ephedrine with caffeine and aspirin as this Is even more likely to cause an irregular or strong heartbeat. A number of athletes reported these symptoms and had to discontinue the use of this supplement. Among the other athletes who had used ephedrine the majority reported a very positive response citing an increased awareness level and greater ability to concentrate while training. I would recommend ephedrine for athletes who do not have any heart problems at all and whose workout would benefit from an increased level of concentration and an increased "psych". It also can benefit pre-contest bodybuilders. Ephedrine compounds are available in various forms. Ephedrine sulfide (sulphur based) is slower acting and has a shorter duration. It Is the least effective form. Pseudoephedrine HCL and pseudoephedrine sulfide are man made versions and are a little more effective. Ephedrine HCL in a high percentage HCL base is preferred by most and has proven to be quite effective. An example is Dymetadrine 25. Athletes have preferred to take this product 60 minutes prior to their workout.